The Fair Lending is an equal opportunity law poster by the Pennsylvania Department Of Labor & Industry. This poster is mandatory for some employers, including employers that rent or sell homes. This poster must be posted in a conspicuous place where all renters and home owners can see it in any place that rents or sells homes. This poster discusses the rights that renters and homeowners have to not be discriminated against when applying for a loan or for finance to repair the leased home, how renters and homeowners can file a complaint if they feel discriminated against and where to get further information on this issue. It appears you don't have a PDF plugin for this browser. 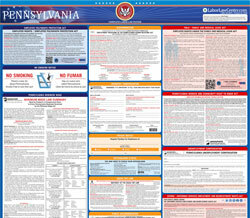 Please see the link below to download pennsylvania-fair-lending.pdf. Pennsylvania Crimes Code and may subject you to fine or imprisonment. because  the user is a handler or trainer of such animals. loans, depository accounts, fiduciary services, and any other services offered to the general public. 27, 1995, P.L. 744, as amended).